Although the Trans-Pacific Partnership negotiation has raised significant concerns from civil society during negotiations, including about the intellectual property chapter, speakers on a panel during the World Trade Organization Public Forum yesterday said the agreement actually includes a positive provision on copyright, while some other free trade agreements under discussion still include stringent proposals on IP. A panel co-organised by the International Federation of Library Associations, IDEA and Innovarte looked at trade and inclusive access to knowledge. The WTO Public Forum is taking place from 27-29 September. Michelle Woods, director of the Copyright Law Division at the World Intellectual Property Organization, remarked on the entry into force of the Marrakesh Treaty to Facilitate Access to Published Works for Persons Who Are Blind, Visually Impaired or Otherwise Print Disabled, on 30 September. She underlined the uniqueness of the treaty because it is the only treaty whose sole topic is to provide exceptions and limitations to copyright. The Marrakesh Treaty is a successful agreement on harmonisation on limitations and exceptions, she said. Jonathan Band, founder of policybandwidth.com in Washington, DC, talking about copyright exceptions and limitations in the Trans-Pacific Partnership (TPP) said IP is very much part of trade agreements. The IP chapter of the TPP actually has some “good limitations” built in, and that is a positive development, he said, although it could be better. For example, TPP provides for safe harbours for internet providers, he said, adding that safe harbours are “incredibly important” for having a robust dialogue and freedom of expression on the internet. The TPP also includes flexibility for parallel imports, and proportionality in remedies, both of which could have been pushed further, but still manifest progress, he said. There is also a provision dealing with balanced copyright, he said. Article 18.66, in the TPP IP Chapter [pdf] (Balance in Copyright and Related Rights Systems) is quite significant, he said. The article says, “Each party shall endeavour to achieve an appropriate balance in its copyright and related rights system,” through limitations and exceptions as defined in Article 18.65, including those for the digital environment. Trade agreements can encourage access to knowledge, he said, even though until now the trend has been increasing rights, there can be good provisions but to achieve that you need to have patience and long-term commitment. James Love, director, Knowledge Ecology International, said a common issue with free trade agreements is that they are mostly conducted in a secretive manner and people learn about the discussions through leaked documents. Agreements such as the Comprehensive Economic and Trade Agreement (CETA) between the European Union and Canada may have a better outcome than first suspected, in this case the copyright provisions, but the agreement still locks countries in to certain provisions. In the Regional Comprehensive Economic Partnership (RCEP) involving the members of the Association of Southeast Asian Nations (ASEAN), and Australia, China, India, Japan, South Korea and New Zealand, some very aggressive positions have been taken by some countries on the IP chapter, he said. “One thing you see in most of these agreements … is the regulation of exceptions,” said Love. There are layers of exceptions for countries, coming from different agreements, such as the three-step test from the Berne Convention for the Protection of Literary and Artistic Works, and in the WTO Agreement on Trade-Related Aspects of Intellectual Property Rights (TRIPS). The so-called three-step refers to a restriction on limitations and exceptions, first stemming from the Bern Convention and stipulating that exceptions are limited to certain special cases that do not conflict with a normal exploitation of the work, and do not unreasonably prejudice the legitimate interests of the right holder. The language for the three-step test is formulated in different manners, and also prone to different interpretations, he said. A broader topic than copyright is the issue of public goods, which should be part of trade agreement discussions, he said. “You cannot just have trade agreements on the privatisation and enclosure of knowledge, and just call it a day,” Love said. Public goods are very important in the knowledge economy, he added. Bernt Hugenholtz, professor of intellectual property law, and director of the Institute for Information Law, University of Amsterdam, compared what he called the old and the new schools of thought of IP. In the old school vision, he said, IP is an important asset for industry, which should be protected against piracy and counterfeiting, and strong IP rights act as incentives for innovation. “Since IP is a healthy medicine, more IP is even better,” he said. This school of thought has led to a “cascade of multilateral, regional, plurilateral norms setting constantly higher standards of IP protection,” he said. The new school of thought offers a more inclusive approach, he said, in which IP plays an important role in stimulating innovation, creation, and dissemination of cultural goods, but international IP protection is merely a means to a broader end, which is increasing general global economic welfare, he said. Besides IP there are a number of factors of “healthy economic development,” such as an educated workforce, freedom of expression, and informed consumers, informed markets, reliable information and communication infrastructure, a vibrant research climate, said Hugenholtz. Maryant Fernández-Pérez, advocacy manager for the European Digital Rights initiative (EDRi), in the context of the Transatlantic Trade and Investment Partnership (TTIP) underlined the European Commission’s efforts to make negotiations more transparent. It is, however, not enough to achieve inclusiveness, she said. On intellectual property, the EU has published factsheets and position papers on what they would like to see in the agreement, she said. One of the focuses of those documents is raising awareness on the benefits of IP, and “we regret that the focus is not also on the human right to access information,” she said. 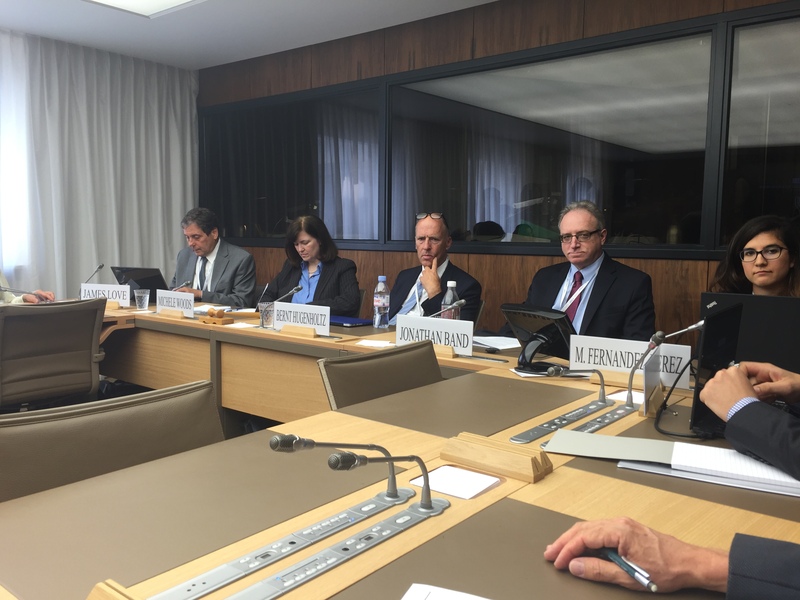 "Signs Of Changing Trends In FTAs’ IP Chapters, Speakers Say At WTO" by Intellectual Property Watch is licensed under a Creative Commons Attribution-NonCommercial-ShareAlike 4.0 International License.